1995 /1999: Studying fashion design/ Egypt. 2008: La Bank Gallery Paris - France . 2007: Darat El Funun / Amman. Gordon. 2007: (Angels Dream. Video installation / photograph) Town house gallery Cairo .Egypt. 2006: (YOU Will Be Killed /video installation . Drawings Space art gallery for contemporary Egyptian art / down town Cairo .Egypt. 2006 : (Booby Trapped Heaven ) video installation / Masharabia Gallery / Cairo Egypt. 2005 : (The Artificial Purple Forest ) video Animation – El Falaky Gallery – A.U.C - Cairo / Egypt. 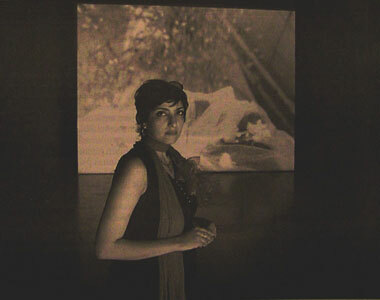 2004 : (The journey) Video installation , Townhouse gallery For Contemporary Art, Cairo, Egypt. 2004: (Transformation) Grant of Pro-Helvetia Swiss Arts Council, Artist’s Residency, Araau / Switzerland. 2008 : Dakar biennale Dakar, Senegal. 2007 : Sharja biennale 8 Emirates. 2006: Dakar biennial - Dakar, Senegal. 2005: XX111 Biennale de Alexsandre des Paysde La Meditranee, Egypt. 2004: Dakar biennial - Dakar, Senegal. 1998: 7th Cairo Biennial, /Cairo, Egypt. 2008 : ( You will be Killed) Ifa Gallary Berlin - Germany . 2004 to 2007 : Africa Remix, (frozen memory) video installation. South Africa Contemporary Art Museum . 2007 : (WITHOUT TILLE ) MUkHA Contemporary Art Museum Antwerp. Belgium . 2006: (Nafas|) IFA Gallery / Berlin /Germany. 2005: [flight 406] sfeir smeller gallery – Beirut. 2005: (Some Stories) Kunst Halle – Vienna, Austria. 2005: (Home Work - Art forum), Beirut, Lebanon. 2004: (Never the right time), Media festival from Arab World - Toronto, Canada. 2004: (Independent Films) Goethe institute – Cairo, Egypt. 2000: Nitaq contemporary arts festival, Cairo, Egypt. 2004: (Kunsten festival des arts) – Bruxelle, Belgium. 2004: (La Rose des vent), Lillie, France. 2003: (Home Work,) Ashkal Alwan, Beirut, Lebanon. 2005: 9th Ismaillia International Film Festival short &documentary film / Egypt. 2003: 7th Ismallia international film festival for short and documentary film / Egypt. 2003: 1st Tirana international film festival for short &documentary film / Albania. 2004: The Swiss –Egyptian video art workshop / Pro Helvetia, Cairo, Egypt. 2002: The Sweden- Egyptian contemporary art workshop /Cairo - Egypt. 2005: Berlin Art Fair / Germany. 2005: Paris Art F air / France. 2006 : Dakar Biennale award ( THMI MANELY Fundation Amsterdam residency program ) . 2004: The state National Prize for Art, Science, Literature, (for using Video as Visual medium - Egypt. 2004: Grant of Pro-Helvetia Swiss Arts Council, Artists residency , Aarau /Switzerland. MUkHA Contemporary Art Museum Antwerp Belgium. Khaled Shuman Foundation. Amman. Gordon. The Musaem of Contemporary Art of Egypt.